The treasure of Russia grows in its regions! The Vologda region is more in size than France, and is one of the most intensive developing for the last years. No development of the region could be possible without the transport aviation, which, as from 1992, was invested and supported in much by JSC "Severstal". The JSC "Severstal" is the biggest metallurgical giant, which made the airport one of its workshops and thus helped it to survive and give the green light for further progress. After having been restructured in May 2002 into "Severstal Airline" LLC, the company takes an active part in economic development of the region. Starting from 1998 the airlines network had been worked out and successfully implemented to become an organic part of the whole transport system of the region. That also laid a basis for the local air transport development both in Vologda region and in the northwestern region of Russia. For example, the Vologda region had more than 20 aerodromes in early 90ths, and now only 4 of them still function. Without excessive modesty one can say that the airport in Cherepovets is the most perspective and successfully developing among the regional airline companies in Russia. One of the obstacles for the regional air companies development is that the government pays much more attention to the giant aircraft enterprises, participating in social, strategic and national civil aviation programs. That is why life of the regional aviation programs often stays in the background. As a result one can see the amount of local aircraft companies had significantly reduced for the passed ten years. The flow of traffic has significantly reduced in the nearest aircraft companies. But the "Severstal Airline" turned out in a radically different situation. In 1992 while being a shop of the metallurgical plant, the company rented a plane, took on engineers and crew, provided them with dwelling. The first flights were carried by one plane and mainly for the plant interests. 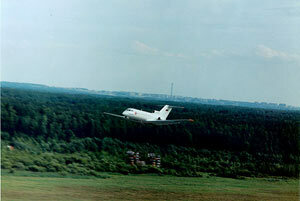 In 1995 the second plane YK-40 was possessed, and the company started to think about the regular flights. The reconstruction of the landing strip was started in 1998. At the same time the landing system was put in action. In a year the runway lighting equipment was changed. The length of the landing strip was increased up to 2500 metres, which made it possible to accept other planes. Then in 2000 the wrecking station was built. The next step was the construction of a modern building for ATB providing for the new aeronautical engineering to be settled in the near future. In 2003 the big work was done to enlarge the agent sales network involving foreign passengers. The agreement with Amadeus company was signed for booking the Severstal flights abroad Russia via the global distributing system. The passengers flow at Severstal flights has also increased after the agreements were signed with the big air companies Finnair and Hahn Air. The efforts in this direction are being continued. The renewal of the control point was completed recently. For the time being the designing of the new airport building was finished and construction works were commenced. Presently 180 specialist work in the company. There is 13 services, including flying, police and ERTOS, SOP, IAS, SPASOP, ESTOP, aerodrome service, motor transport service with 30 vehicles, aircraft fuel supplying, aviation security service. Now the air company works successfully and has plans for future. The regular flights, charter program and not large transit/airport activity altogether make it possible for the company to stand stably on both feet, to increase passengers flow by 15 % in comparison with the last year 2003 and even invest the earned money into further development. The "Severstal Airline" has good staff, of the mean age of 35-45 years old. Last time young people are also actively engaged. The company spends much money for staff development and enhancing professional skills. For the time being the airport has 5 planes YK-40, the training centre "Aviation club" for the pilot amateurs, and modern aerodrome. Cherepovets is a big industrial centre, leader of the Russian metallurgy. We have connected it by the regular flights with Moscow, St.-Petersburg, Petrozavodsk, Helsinki, Veliky Ustyug and Kirovsk (Apatity). Having found our niche we took it, keep developing and make our contribution into development of the Russian Civil Aviation.